On October 18th, 2017, Eric L. Harrison presented as a speaker at the NJICLE’s seminar on “2017 Hot Topics in Special Education” at the New Jersey Law Center in New Brunswick, NJ. The seminar focused on the latest developments in regulations, case law and current issues affecting special education. To finish out 2017, on December 7th, 2017, Eric L. Harrison presented at the New Jersey School Public Relations Association’s workshop on “Social Media: Don’t Delete that Comment! First Amendment Rights and Public Records” in Pennington, NJ. 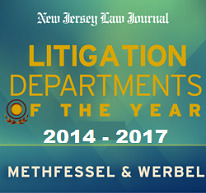 To begin 2018, Marc L. Dembling will be a moderator and speaker for the NJICLE’s presentation of “Insurance Law Update 2018” on January 20th, 2018 at the New Jersey Law Center in New Brunswick, NJ. Friends and clients with any questions on past or future seminars are welcome to contact Eric L. Harrison, Paul J. Endler or Marc Dembling directly.